Our Tough Coat uses 100% pure acrylic resin and is perfect as a sealer for high traffic surfaces such as table tops, seating, doors and floors. It dries to a satin finish. Unlike most of our competitors, it is non-yellowing. Both the brands of Tough Coat that I carry are the same and are made by Homestead House in Toronto! No matter what the type or quality of the product, top coating is one of the most difficult furniture finishing steps to get right. Spraying can give a premium finish, but not everyone has the equipment nor the space to set up a spray area. Brushing can work but it takes a lot of practice to perfect the technique. What if I told you I found a way to apply Tough Coat that gives a great finish every time? Allow your freshly painted item to dry for 12 hours. Wet a microfibre cloth and squeeze it out thoroughly. Fold the cloth into the width of a hot dog and tightly roll it up to about the size of a hot dog bun. Mark a 500ml Lee Valley squeeze bottle as Diluted Tough Coat. Learn from my mistakes and don’t bother with the dollar store squirt bottles. They leak like mad and make a big mess! The best dilution is 10:1. That’s ten parts Touch Coat and 1 part water. Gently mix Tough Coat (but don’t shake as that introduces air bubbles) to blend the matting agent with the acrylic. Add 200ml Tough Coat and 20ml water to the squirt bottle. Hold the roll and dampen it along one smooth edge using the squirt bottle. Wipe the roll over the surface in a row from left to right in one long stroke. Do not go back over the same area twice. Missed areas will be covered in the next coat. Repeat going along in rows across the piece. Re-wet the roll when you start to seeing streaks. Now step away! Do not be tempted to touch anything up! Thoroughly rinse your microfibre cloth in clear running water between coats. Repeat every two to four hours until you have two or three coats. The top will be dry to the touch in a few hours, but will take 21 days to cure. 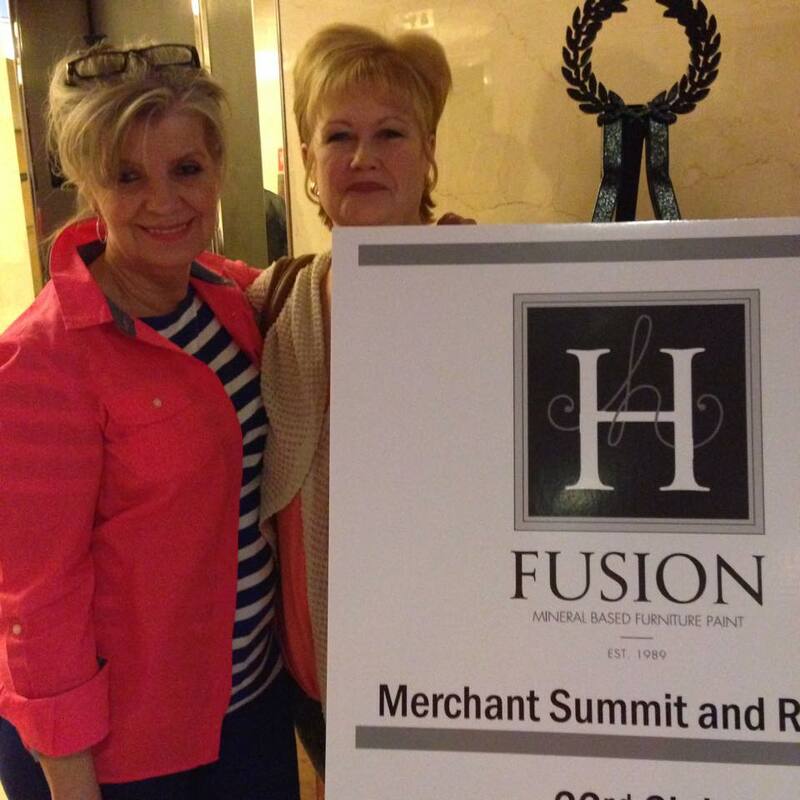 I had a great time in Vegas at the Fusion Mineral Paint Retailer Training. Vegas is such a great place for walking and gawking. I think my favourite hotel was The Paris in Las Vegas mostly because I want to go to Paris one day. This is my my picture that could be a postcard; it turned out so lovely! I learned lots and have some great ideas for new classes which I'll be running soon. I met lots of great people too. This is Brandy, our Fusion retailer from Swanky Luxurious Vintage Home Furnishings in Kamloops. She lead me astray in ways that will stay in Vegas. Right Brandy? Sheila from French Vanilla Home in Victoria is another new friend.! This is Brandy and Sheila after .... what happens in Vegas stays in Vegas. Am I right ladies? Are they knobs or are they drawer pulls? Do you say knob or do you say drawer pull?